Hi, my name is Victor and I want to introduce you in here to my trading style and my Darwin VIW. I have been trading market structure based on Wave Theory since August 2014 when I joined Anil Mangal, the creator of the Wave Theory as I know it. To me (and others with me) this Wave Theory has proven to work. I had some challenges in trading psychology and learning how to think about trading with people investing in me, more detail about that below under "About my history". Based on that I see an importance in Investors seeing how my equity relates to my balance and how I am in line with my goals. For this purpose I share a link to my account on Myfxbook. With wave trading there are many levels to trade from big waves to small waves. Big trades have big corrections and small waves of course have smaller corrections. With these goals/aims it is my purpose to make the wave trading a viable investment. If you have any questions please add them to this chat topic. If you choose to enter an investment on my Darwin please check the equity percentage first. That mostly can still go back to 100% or even to about 90%, which will put me in about break-even or a small draw-down whilst if you start investing at a high it can put you in a bigger loss. In March 2012 I learned about the Forex. Before that time I never heard of it and did not know what a pip was. Then, after a month of studying babypips, I opened my first account the start of April on Etoro (not recommended ), divided my account in 5, invested in 4 others and kept 20% to learn trading myself. In the 1st week I lost 20% of my account. I decided that this was not the way to go and concentrated on learning myself. A week later I joined a group paying, for me, a lot of money in a monthly fee for charts, learning and a trading room. The good thing with that was I never blew up my account . I did however see my account decline over time. At some point another student from that group was promoted as doing an advanced course. In August 2014 I gave that a shot, and this for me was life changing.The first half year I actually already saw my account going up again instead of down. Also I saw that I needed much less tools and after paying once for the course there was no monthly fee either. After about half a year we started a trading room. My learning went up incrementally by being in that trading room. Of course, as it goes with euphoria, I became over confident and came into big draw-downs. Nothing account threatening but still it slowed down things immensely. So in August 2015 I started a new account and although I had quite some draw-downs it was successful. After 3 months I made it available for copy trading. Within 2 months I had something like $300K following. But I did not really see anything coming back from that in payouts and I was not too happy about how that was going. Then someone from the Darwinex community pointed me in the direction of Darwinex, I studied their site and video's for about 2 weeks and what I saw was highly impressive. In the beginning of January 2016 I migrated that account to Darwinex. This started a new journey of learning. Already quickly I noticed that it was very tough because now the equity became much more important than the balance . On top of that there were some challenges in the market starting February 2016 that caused me to go in a draw-down and this whole thing was a challenge for me in the area of trading psychology. It took me a long time to get out of that and this was, as you can imagine, loosing me investors (WZG Darwin). When having come back reasonably half way last year I saw another draw-down happening And still not having fully recovered (mentally) from the previous one I entered a spiral of loss-aversion. This has resulted in me trying to get a better hold on that from the end of last year (making a few restarts with new accounts). In wave trading there is a validity in having big draw-downs as long as the structure is still doing what is expected. A challenge in this is to find a right balance in account-size, time and appearance to (potential) investors.This lead me to the the start of this new Darwin (VIW) in February this year. When I saw I could now choose the letters I went for V I W as short for Viable Investable Waves also to keep it as a reminder to myself that trading the waves must be viable for investors. Great to see you back Victor! Preserve zen capital, do the small things right & protect your downside, and good things will continue to happen! Nice start (and big performance this month)!! May I wish you to reach success in this new step of your evolution! Already quickly I noticed that it was very tough because now the equity became much more important than the balance . Excellent point, the balance doesn't mean squat when the spouse thinks a vacation is in order. lol. All the best in your Darwin. Small update on progress since the end of May. There has been a "stormy" ride over the last few months. Sometimes the waves were a bit higher than expected and I did keep pretty much within the 10% between balance and equity. Although my drawdown went a bit higher than I said it would. 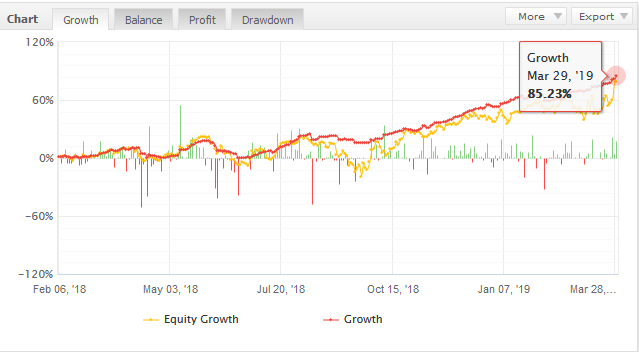 This was mainly because it turns out that I didn't get the concept of drawdown right (pretty much thought it was in relation to my balance, it actually isn't as I am sure many of you know better than me It is in relation to the all time high balance (as I noticed in myfxbook). I have adjusted that in the goals/aims because I do feel I need the freedom to ride the waves. Right now I closed most of my trades (still have a few that currently have together about 2% negative exposure) and my balance made a new all time high (not yet the equity ). The realised profit on my own account is a bit over 22%. I do see that I still need to work on trying to make the journey more smooth. I understand that potential investors can still be put off by the height of the waves that i ride (and maybe even the risk manager ). So in the coming month it will be my focus to improve on that. A small clarification I feel is needed at this time. Part of my open trades is on Silver buys, these trades I plan to hold on to for some time. This will influence the state of my account and the Darwin. To give an idea of the impact on these and to provide a better idea of the development of the other trades in the account I plan to occasionally give feed-back on the exposure it has. Please let me know if this is useful or not. The equity is still behind, mainly because of my open Silver buys. The Myfxbook reports a gain of 36.89% (not bad on an account started from February this year, wave trading works ). About 50% of the weeks I reached my weekly target (set in Myfxbook) and about 70% of those it was well over target. About 36.5% of the weeks were loosing weeks and about 60% of those I took big hits. The Darwin shows 13.38% gain on an equity level of 96.66%. That is still quite distant from the results on my account. There is still quite a way to go!! Less large losses and keeping balance and equity closer together.. Still moving in the right direction, Myfxbook now reports 49.2% gain on the underlying account. The last 5 weeks I have made my target (see myfxbook: Goals), The last 4 weeks well over target. Also I am very grateful for the Investment from Darwinia as a result of January It is my intent to make it grow the coming months . Which investment do you refer to ? Nice performance, by the way ! At the standing of last update of the month yesterday I was on 55th place in the Darwinia. Thanks for clarifying it ! And congratulations for the rank ! @CavaliereVerde : I got confused due to the current VIW rank and couldn't check the January results as they aren't yet published . I have to dig more about DarwinIA calculations and specificities (as any data "reset" at the beginning of the month, etc.). As we have come to the end of the first quarter I thought it to be some time for a self reflection. My focus in relation to my Darwin has been to try working on making the threshold lower for investors to get interested in my Darwin looking on how to lower the draw down. I have noticed time and time again that this would be easier if I were able to spent more time with the computer and the charts. I have come to the conclusion for myself that I do not see this to be feasible. My style of trading is that I analyse the structure of the market based on Wave Theory and make a projection for myself where the market is going. Mostly it works out that way, although the timing may be off. Often I see it may need some more time but I know I won't be there to to take it and if the circumstances are good enough I may enter already then. This way of trading will inevitably lead to draw downs and personally I have no problem with that. If the structure is changed or if I believe I need to make adjustments in how to apply my risk I may close trades, even for a bigger loss. It is my view that if I keep doing that then the equity has to follow. The red weeks are losses, the yellow ones I made my target. As you can see the average for the first quarter is 1,51% per week. So I am actually happy with these results so far and the development of my own trading account. I will focus on continuing growing in this way. I know that probably makes me uninteresting for short term investors and that is fine.